OMG a Skulltag map! Not only that, a single player Skulltag map! 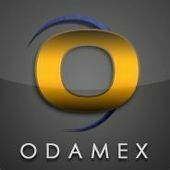 This is designed to show off the features of the newly-released version 0.95b of Skulltag. These are all gameplay-related, including enhanced monsters, a ton of new weapons (not replacing the originals, mind you) a rune system that gives various effects and new powerups (including a cool one at the end). The map itself is medium-sized, and in two halves theme-wise. 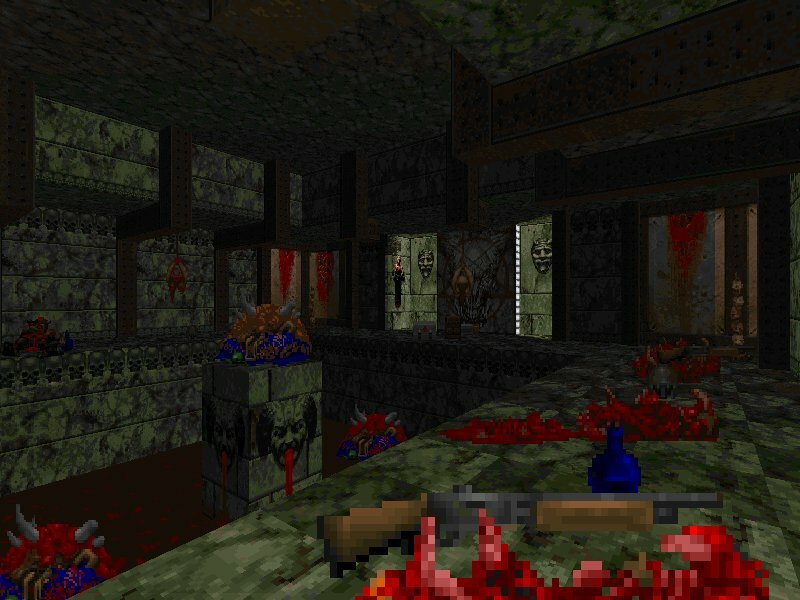 Detail is pretty good in the gothic half and reasonable in the modern half, with ZDoom features being use a lot, too. Despite all the new stuff, the gameplay is pretty tough - there's not really enough health to go round, and ammo will be a major problem later on. But this map does it's job well - and I think we'll be seeing many wads being designed for Skulltag in the future. Also for the newly-released Skulltag 0.95b, this is a sound wad that adds the Unreal Tournament announcer to the proceedings. Just for a bit more atmosphere in the arena. 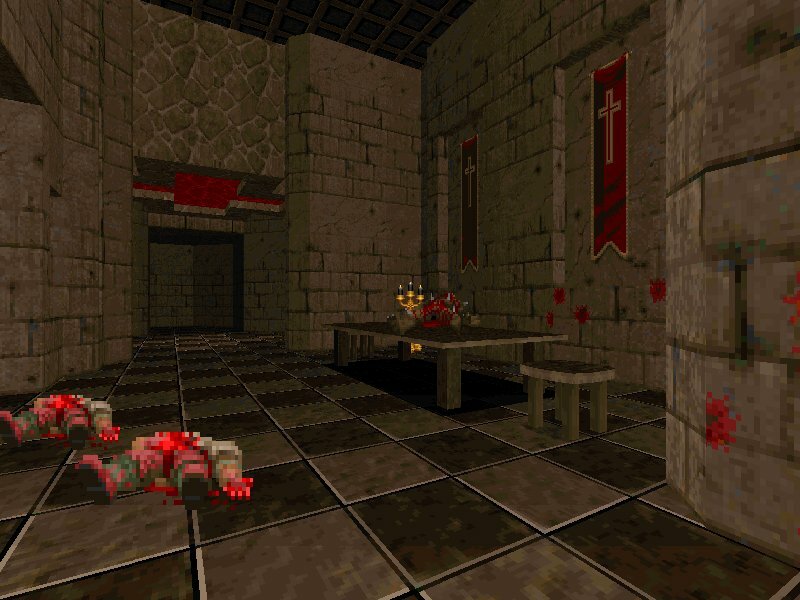 A small Quake-style deathmatch map with some Quake-like textures and a slight resemblance to the E1M5 there. Detail is surprisingly good, despite the bareness of the passages. The layout is passages and small/medium rooms, with no doors, lifts or large areas. Lead-slingers and rockets only, and some health/armour too. Given all this, the gameplay should be hunting-based, with the occasional suicide thrown in. 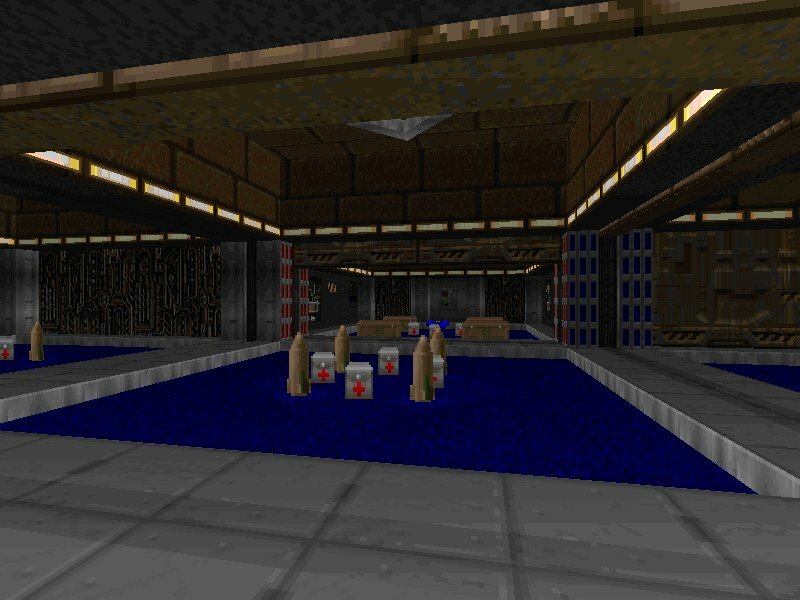 A small deathmatch map set in a sewer. It's dark, Phobos-like and has plenty of the green stuff. In fact, the sludge pits are fake underwater zones and are fairly deep, so no escaping should you fall in. The areas are pretty bare though, and some of the wall lights could've been used a lot better than they are. All weapons are in except chainsaw and BFG, with some health and armour around, too. The fluent layout means that battles should be fast-paced despite the darkness, and the inescapable sludge pits place an emphasis on control as well as style, damage and aggression. A large deathmatch map set in a base. It's dark (until you go outside), pretty industrial-looking and has a lot of detail. In fact some of it is really impressive, although texture alignment is a bit off in some places. Non-plasma weapons are used, with some health and armour around as well. The indoor part is reasonably open, with no real hazards apart from the other players, and if you want a really open battle (or to escape the darkness), go outside. However, the size of the map means you really need to bring along a few more friends to frag with. A rather silly wad comprising of a huge grid of identikit square rooms with identikit contents (the rooms look quite good, btw). Gameplay consists of blasting away millions of lost souls/pain elementals with rockets (and secret plasma gun). 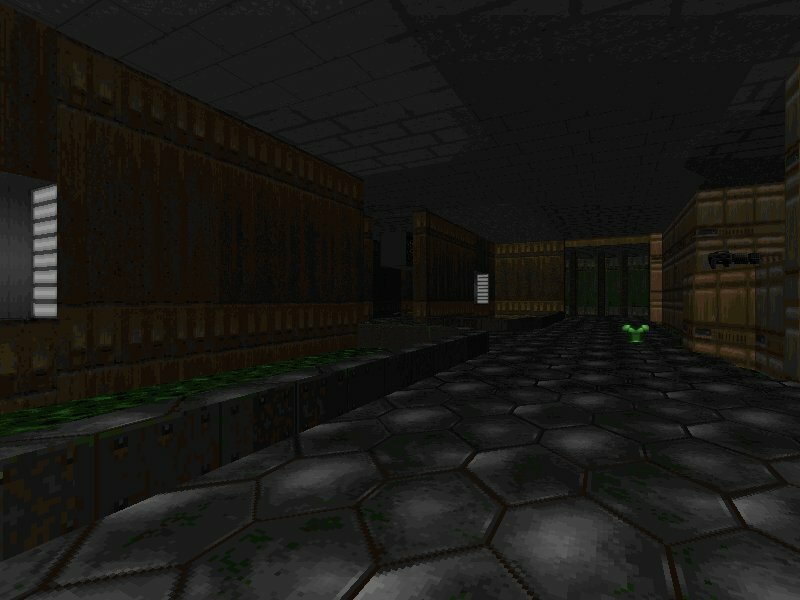 And in ZDoom you have the added annoyance of reloading your save every time a lost soul opens another door (releasing an unstoppable plague). The only way to succeed is to magically know where the important rooms are, use god mode or break F9. In short, don't bother. A fairly small but good looking wad set in some kind of castle. New textures give a nice castley feel to it, and Legacy's 3D floors are used to create...(drum roll)...for the first time ever...wait for it...real tables and chairs! The rest of the architecture looks pretty good, too. Gameplay-wise, there's nothing tougher than a demon, but there's a new imp which is pretty tough. The health and ammo are precariously balanced, mainly due to the new imps. Not bad, and there's even no crashes to boot (w00t!). 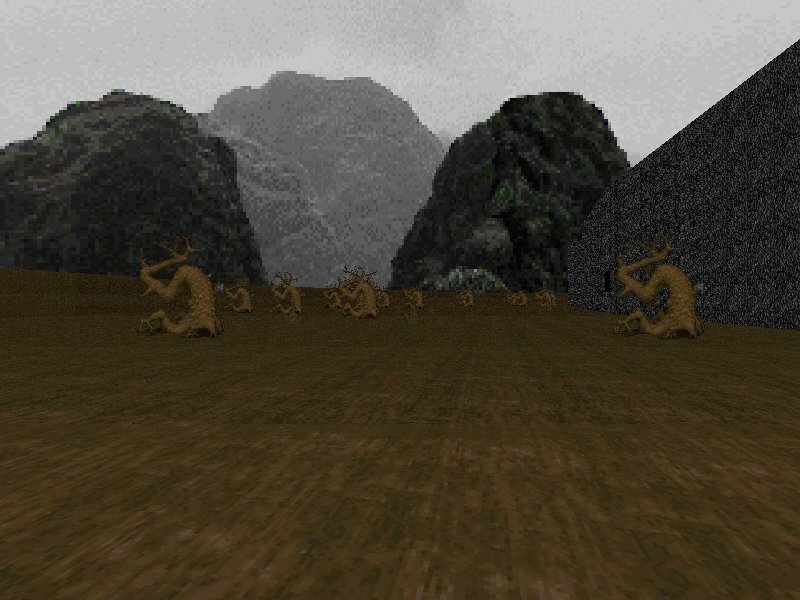 A fairly large DooM 1 map that doesn't take as long as a large map normally would. It's set in a remote mountain region, and the outdoor parts of this map together with the Phobos sky really do make you feel like you're out in the mountains. Inside, it's an old-fashioned maze of passages with a hellish theme. But this maze isn't that complex, as there are no dead ends and only two rooms and one key to find. After that, it's more outdoor trekking without foot blisters (it is only a game). 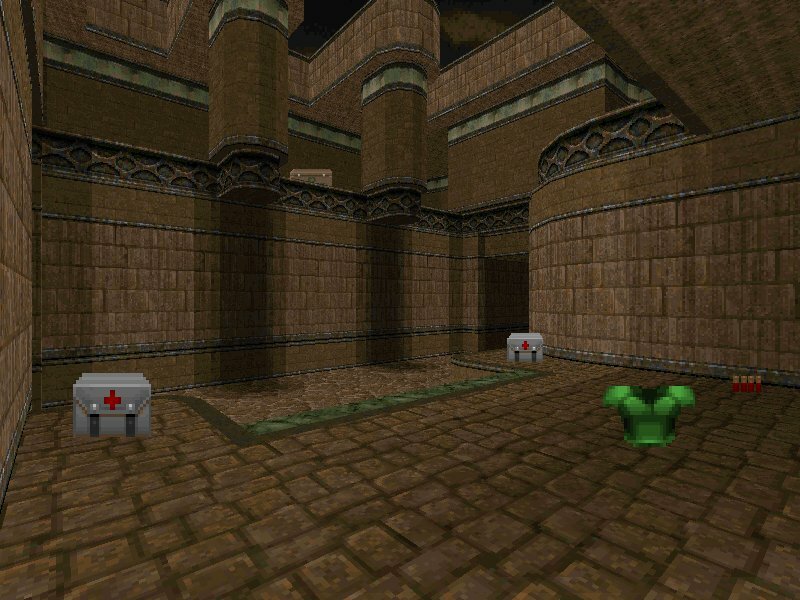 Plenty of monsters are around, and plenty of ammo to blast them with, but watch the health while maze-running. 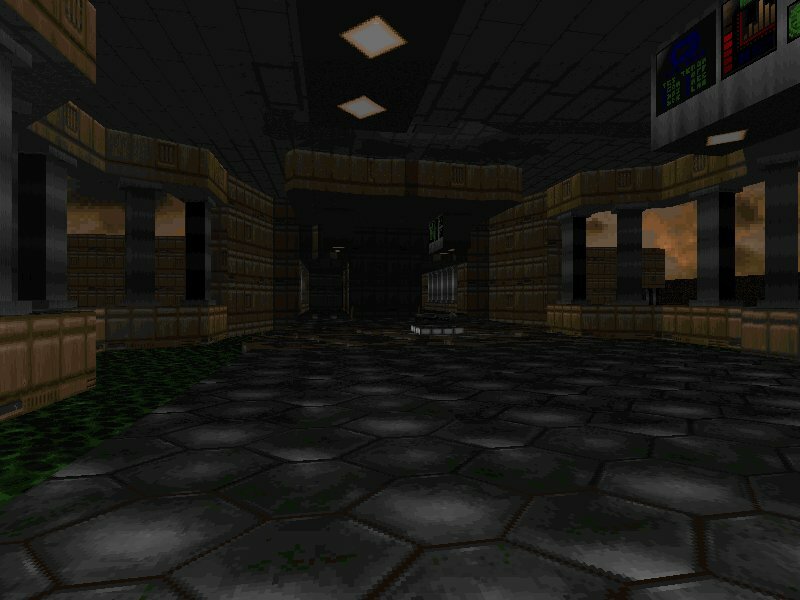 The only downer on this map is the detail, which is pretty bare indoors (except for the second room) and also quite bare outdoors, but this doesn't dampen the atmosphere - in fact it gives the map an old-fashioned feel to it (like the sort of map found on the data cd's). Nostalgia hunters will enjoy this, as will most of you I think. omg an iikka keranen map omg! WTF Iikka Keranen..? OMG HE'S BACK ! Hmmm, a lot of DM maps. I know people do play a lot of DM, and obviously SkullTag will up that as well, but seriously, how many of these are going to get much use? Every week there are a crop of DM maps that I'm sure most people will just fire up in SP mode, say "oooh pretty" and then quit, never to see the map again. Every week there are a crop of DM maps that I'm sure most people will just fire up in SP mode, say "oooh pretty" and then quit, never to see the map again. Anyway, maybe when I get the bots back into ST, people will play these maps more. In fact, I'm pretty sure that will be the case. I've been asking myself these very same questions. Ditto. I think at least 2/3 of all dm wads (80-85-90%) never see the light of day again after people tried them once. Black Mountain sounds good, I'll go try it. What. Just because the idea is silly, that doesn't mean I didn't go through some effort making sure the map is playable and stuff. By playable I mean being able to clean every room and finish the level without cheating, with reasonable difficulty. Come on UD you're supposed to tell me which wads are the newbie wads so I don't download them. It's your job! Guess I'll go play Teh pain Emmental! Come on UD you're supposed to tell me which wads can lag some computers so I don't download them. It's your job! Maybe there aren't any this week? Sometimes yes. It's a rather ok excuse. Espi! OMG bad review! :P It is pretty hard. OMG play Wart 01 people! I think if a DM map is really good enough it's worth running a server for. I'd like it better if there was more than one map per wad though. If you want to run a few of these, you'll have to modify them to be on subsequent map numbers, or combine them all in to one wad. So my suggestion, especially for this SirTimberwolf, if you're going to release more than one dm map to newstuff (even if they were made at different times or whatever) that they all get put into one wad so people can enjoy them together. His are for Legacy so they're not all that great for my SkullTag server, but it still applies. Bah! Why is it that every time I take a break from my megawad to make something else, the same damn idea gets released in /newstuff two weeks later!? ....oh, well. Mine's gonna be for Heretic, anyway (if it even gets done now). Yeah... though I don't know how this is different with SP wads. There might be more SP players because you just need one player, but the PWADs per se aren't played many times unless they're stuff like AV or something else that's super cool. 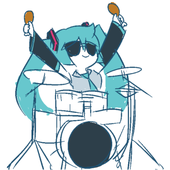 That is, only a few SP wads are played more than once by whoever plays them. Were all the others "worth it"? Probably not much. I uploaded Keränen's "Yesterday's Brownies" when I noticed the planetquake link gave an ugly (permanent?) 404. It's also listed on Ricrob's page, where I got it off the sickly 3DDownloads thingy after waiting over 10 minutes. So I thought it was well worth uploading a WAD by a classic author, especially since I've just played it and had played it in the past. Dunno about the other DM wads... I ain't touching them, but who knows, someone might like them. As for the wad, The Ultimate DooMer isn't far off in saying it's "hunting-based." It's rather small, but the many curves and ups and downs, plus the lack of energy weapons gives only the SSG or rockets for fast kills, so you don't get many frags. But those many curves and height changes plus the small size do inspire suspense while playing. I prefer /usr/bin/ftp, that interface has not changed since 1970. Not to toot my own horn, but toot! I did tables and chairs in EDGE with 3d floors in my castle demo, and a lot of unique 3D at that in general. And that was released on 9/16/2001. Yeah... though I don't know how this is different with SP wads. If Torn was agreeing with Enjay's post, then I suspect he meant that people look at them once in SP mode, and then never play them ever in DM - i.e. they are not used for their intended purpose at all by most people. On the other hand, if an SP level is played once by most people in the community, then that can be viewed as a success, since it is being used as intended. Sure, I imagine there are few modern SP wads that get more than 1000 plays in total (except if they are very demo-friendly, and some nuts play them hundreds of times...), but then the mapper probably realizes that beforehand.